Thrivent Financial and Affordable Shred sponsor this Free Shred Event. Bring your personal papers and Watch the shredding. Come support the Church Youth Group.and Habitat for Humanity. First National Bank’s third annual Customer Appreciation Day is set for Friday, May 20th at all three First National Bank locations. All current, and future, customers are invited to join us for lunch from 11:30am-1:30pm. Twyford’s BBQ will be on-hand again this year with great pulled pork sandwiches. We’ll also have soda and chips. The Affordable Shred mobile shred truck will be on the lot at the Morton and Massey branch in Jacksonville from 11:30am-1:30pm. 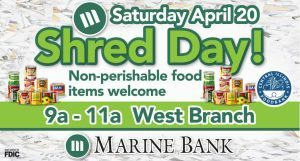 If you’re doing some spring housecleaning, bring in those old documents, tax returns and more for free shredding while you watch. You can also sign up for a $50 Chamber Check give-a-way during Customer Appreciation Day. 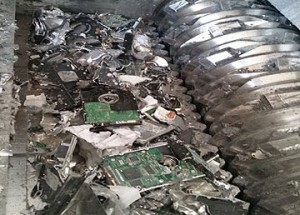 Our New Grinder Truck shreds whole computers, hard drives, flash drives, copiers, smartphones, credit card swiping machines and other electronics. Our strong and secure locking shred carts with slim design are more conducive to office settings compared to other traditional shred carts. A reinforced front lip ensures longevity while top lid paper slot helps to maintain a clean and organized collection of documents. New executive gray color that easily blends into any office decor limits the visibility of paper dust and coincides with the Slim Boy console line.